Samsung QE49Q7F 4K QLED review | What Hi-Fi? The QE49Q7F has everything going for it. Unlike its larger siblings in the Samsung QLED range, there’s no OLED for it to be benchmarked against (OLEDs don’t currently go smaller than 55in) and, at this stage in the annual TV cycle, it’s been discounted massively from its initially premium price. Sure enough, it’s a belter of a telly – one of the best at its size and price. But not quite the best. Samsung has prioritised punch with its QLED TVs, not least because that’s a point of differentiation between them and OLED equivalents. And even though this 49in version of the Q7F is without an OLED rival, the panel’s punch is instantly persuasive. We play Guardians of the Galaxy Vol. 2 on 4K Blu-ray and the HDR performance is dazzling. As the opening chapter transitions from the American Midwest of the past to a distant planet in the present, the picture also transitions from soft textures and hues to bright, sci-fi materials and colours - and this is where the Q7F is really in its element. The generators dotted around the edge of the platform where our heroes face the dimension-hopping Abilisk contain balls of angry energy that pop from the Samsung screen in supremely bright and vivid fashion. No rival can match this TV for all-out vibrancy. But it’s not as unsubtle or in-your-face as that might suggest. On the contrary, with the right settings the Q7F is more-than capable of nuanced shading and gentle colour gradients. Skin-tones are lush, but also controlled and natural, and wide landscape shots demonstrate good realism through the spectrum. Detail levels are superb throughout, and they combine with terrific sharpness and edge definition to produce a picture with a real sense of depth and solidity. Black performance is also good, especially for a TV with a backlight that consists of LEDs only around the edge of the screen. When the TV is asked to display a small, concentrated patch of white in an otherwise black image, it does so by passing light across the whole panel, which sacrifices the purity of the blacks - but not by nearly as much as some rivals do. What’s more, the backlight is uniform, with none of the blooming or clouding that’s often associated with LED backlights. Clearly an OLED TV does this sort of thing better, but at this screen size that's hypothetical. The Q7F is consistent with all sources and content types. You’ll be watching lots of non-HDR content (at least in the short-term), and this Samsung again does a great job of boosting colours without pushing them into garish unrealism. Similarly, 1080p and lower-resolution content is sharpened without looking artificial. Even standard-def stuff is relatively controlled and clean. Gamers will love the QE49Q7F. Not only does its preponderance for punch, vibrancy and excellent definition lend itself to computer-generated graphics, the set is also super-responsive. It delivers an input lag measurement of under 24ms - all in all, this is a great set to play games on. But performance isn’t perfect. Though fairly natural and nuanced, it’s not the last word in subtlety. At this size, that title belongs to the Award-winning Sony KD-49XE9005, which is just a touch less out-there in its delivery and slightly more balanced as a result. The Sony also digs up a bit of bright white detail the Samsung misses – something you can see in the cloud formations at the start of Planet Earth II on 4K Blu-ray. The Samsung has a couple of other flaws, the first of which involves motion-handling. 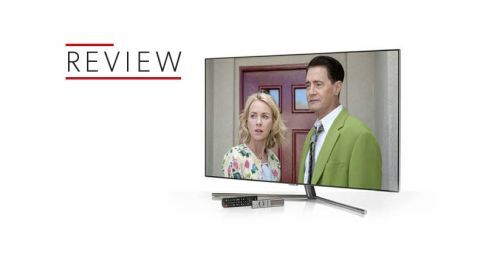 It’s certainly not bad by the standards of most TVs, but it forces you to choose between leaving the motion-processing off and putting up with a little judder and blur, or turning it on and motion consequently looking a little soap opera-like. For what it’s worth, our preference is for the former - but the Sony involves no such compromise, with its clean, judder-free ability with motion. The second flaw is the viewing angles, which are as poor on the Q7F as they are across the 2017 QLED range as a whole. The picture washes out when you’re not sitting fairly straight ahead to the TV, but how much that matters to you will depend largely on the layout of your lounge. Whatever you watch on the Q7F is accompanied by good, if unspectacular, sound. With Standard mode the audio performance is pretty well balanced, with decent depth by flatscreen standards and well-controlled treble. It doesn’t project sound a long way into the room, but this is still the mode to use for most viewing. The Optimised setting boosts bass and treble and adds an extra degree of oomph. It’s a bit full-on for general viewing, but can be worth it when watching an action film or playing games. In short, the Q7F delivers the sort of sound quality we’ve come to expect from a TV of this size and price, which means it can be easily and massively enhanced by the addition of even an affordable soundbar or soundbase. The Yamaha YAS-207 or Q Acoustics M2 would be excellent, cost-effective options. Samsung has done a great job in recent years of refining its Tizen-based TV operating system, and it’s now perhaps the best around. Only LG’s webOS runs it close. This is a simple, clean and intuitive OS, with neat touches such as background tuning of Freeview and satellite channels. In general use it is snappy and fluid, with all sources, apps and features turned into big, bright icons, the order of which can be customised for even quicker access to those you most frequently use. Two remotes are supplied in the box: a practical black plastic clicker and a slicker, sleeker silver wand that comes close to striking the perfect balance between minimalism and functionality. The addition of a dedicated EPG button might be enough to get it there. This silver remote also packs in voice control - but we only find that useful for activating or deactivating Game Mode, which is otherwise buried deep in the settings. Samsung’s admirable quest for simplicity extends to the picture settings, which are clear and concise. The Eco settings are a barrier to performance, so we’d recommend turning these off immediately, and use a THX Optimizer disc to tweak the picture to your liking. We find the picture is improved by taking a few points off the Brightness, Contrast and Sharpness settings, and by turning the Contrast Enhancer and Auto Motion Plus modes off entirely. The good news is the HDR defaults are almost spot-on, though we’d recommend turning off Auto Motion Plus and dropping the Sharpness down. Thanks to Samsung’s dedication to bringing almost every major streaming app to its platform, you’re unlikely to run out of things to watch on the Q7F. Netflix and Amazon Prime Video are present in their 4K/HDR guises, all four of the UK’s major catch-up services are on board, Now TV gives you access to Sky programming, Google Play Movies and Rakuten let you stream stuff on a pay-as-you-go basis, and Plex is there for you to watch videos you’ve already downloaded. There’s Spotify too, should you wish to use your TV as a music player. The only thing that’s missing is a platform for streaming 4K blockbusters along the lines of iTunes on Apple TV 4K. Samsung has at least had a stab at that with its own, Rakuten-powered, TVPlus app - but the paltry selection on offer is barely worth registering for. We’d suggest adding the Apple TV or a 4K Blu-ray player if watching the latest movies in 4K/HDR is on your agenda. Any sources you choose to add will be plugged into the One Connect box rather than the TV itself, with the two linked by an almost impossibly thin optical cable. It’s a neat system that can be used to keep cable clutter a long way from the screen, but it does require each part be powered separately, which can be a bit awkward in some set-ups. The upside is an extremely neat and thin design by backlit TV standards (OLEDs can and do go much thinner, mind). Samsung’s QLEDs are still among the most stylish TVs around, boasting elegant stands, thin bezels and a premium, silver finish. The QE49Q7F is an excellent TV, and almost the best in class - it falls just short of the Sony KD-49XE9005 for natural nuance, motion processing and viewing angles. It responds with a significantly slicker operating system, better styling and punchier pictures but, on balance, we’d take the Sony - particularly as it is currently around £200 cheaper. Still, if you’ve got a taste for the more vibrant things in life, use your TV first and foremost for gaming or like the idea of the One Connect box, you may well feel as though that extra outlay is money well spent.